> Education > Building confidence, on the fairway – and off! Written by Jaspreet Kaur, Additional CEO, DIR India. When offered sandwiches, Arti shyly takes one but politely refuses to eat more, saying simply, “We are used to eating less.” She decides to leave the rest unsaid. In reality, Arti and her family remain in a difficult situation; she lives in a small home with her parents and one brother. As her older brother and sister are both married and living independently, and her parents do not work, Arti’s unmarried brother has been the only income earner for some time. Stretching his salary as a lift operator − INR 5000 per month (~USD 85) − to pay rent, food and all expenses for four adults is a tremendous challenge. It is easy to understand that such a family must make many sacrifices and compromises to survive. Thanks to DIR, Arti (18 years) is qualified to serve as a “C” class caddy. Lata, the DIR Health Promoter for the area where Arti’s family lives, recognized their great need and knew that DIR could help. 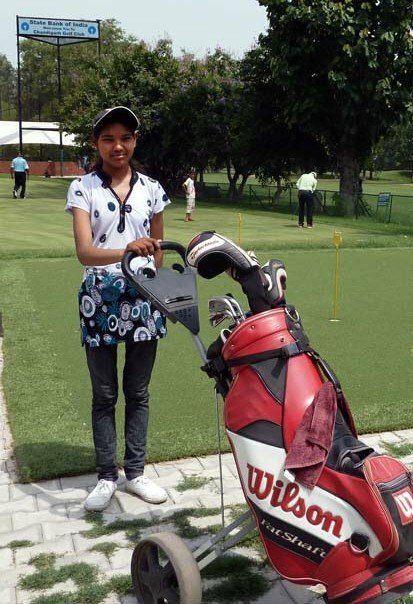 In collaboration with the CGA Golf Range and Academy in Chandigarh, DIR has developed a caddy training course for young people from Janta Colony. Lata encouraged Arti to enroll . Luckily for Arti, her family expressed no opposition; whether out of desperate need or a desire to see their daughter succeed (perhaps both? ), her parents shed the traditional moral codes that prevent most families from allowing their daughters to go out and work. Arti faithfully attended the six-week training course , eventually qualifying as a “C” class caddy. At this level, caddies can earn INR 150 to INR 200 per game (USD 2.50 to USD 4.20), with the golf course insisting its members pay equal rates for male and female caddies. Considering that some basti+ residents earn INR 100 per day for menial labour, the earnings Arti can contribute to her family are quite substantial. As I drop Arti at the clubhouse for a pre-scheduled game, it suddenly occurs to me that just getting to work must be a challenge for her: Janta Colony is 7 to 8 km distant, with no public transport . When I ask how she gets to the golf club, Arti beams with pride. As soon as she finished her training, she borrowed a bicycle from a neighbour and taught herself how to ride within just a few hours. She clearly takes pride in being able to go independently to the Club whenever she has work, and in giving the money she earns to her mother, who is unwell, after every game. Initially, she was able to borrow her neighbor’s bicycle to get to the golf club but as it is not always available when she needs it, DIR is considering giving Arti a loan to buy one of her own. Arti sat for her Class 12 exams this year. At present she is preparing to re-write the English exam, for which she received a compartment. After graduating she will be able to get admission in a private college for additional studies. She plans to pursue her education along with working as a caddy. + basti is the Hindi term for a settlement, which usually connotes an area where the poor live under service-deficient conditions. DIR is grateful to the Mr. CSR Reddy, President CGA Golf Range and Academy, Chandigarh for its ongoing support to DIR for conceptualizing and executing the Caddy Training Program for the young adults of Janta Colony. Apart from their earnings, it is an important chance for these young people to build social skills and make connections within the Chandigarh community.